I suppose I was influenced by the 1975 Thomas Harris novel, Black Sunday, about a plot by terrorists to commit mass murder during a Super Bowl, which was made into a film. It always seemed like fiction until September 11, 2001. And every time I wait outside of a Swans match at the SCG or ANZ stadium, I wonder what will happen if during a search for booze, they find a bomb instead. Okay, this is a bit far-fetched, but so is an attack on the Boston Marathon, which results in the deaths of spectators, including an 8-year-old boy, and horrific injuries to innocent victims cheering for the runners bringing up the rear in the most famous race of its kind. And to see 78-year-old third-time marathon runner Bill Iffrig knocked down as a result of the blast was also far-fetched (see The Boston Globe photo above and link to his story here: http://bit.ly/109GZi8) But it happened. So I guess my fears are not that far-fetched after all. It was about 4.30pm on Tuesday that I realised I was getting depressed by watching television and listening to the radio all day … as well as logging in to Twitter and Facebook. On the latter, I heard from my friend Mary who had been to the marathon as a spectator and had a photo of her niece waving to her as she left the starting line. Fortunately, her niece was a mile away from the finishing line when the explosions occurred, but her running partner was taken to Massachusetts General Hospital. There is still no word on the injured runner, but the contrast between the morning happiness and the afternoon tragedy was not lost on Mary. She replied to a friend on Facebook: “The starting line was so incredibly much fun. Can’t believe this has happened.” She also posted the photo below on Facebook with the words: “Let’s never have violence beget violence. 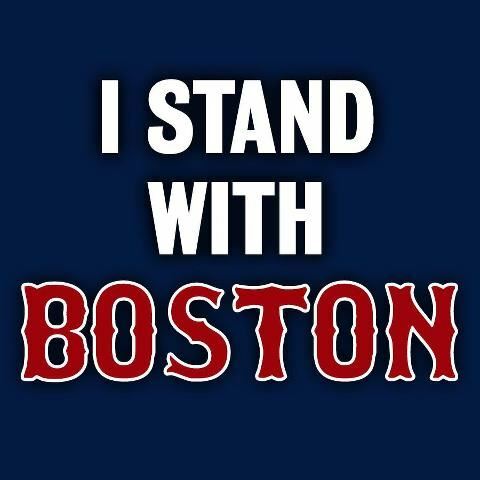 Stay strong Boston. You are in our prayers.” Mary, you are in mine. Update: Mary’s back in Vermont raising money for the Boston Marathon victims. Do I have any solutions? Not really, except in terms of communities coming together to help each other. Shane Victorino and Curt Schilling mentioned it. It happened during 9/11 and the Bali bombings, the recent Queensland and NSW floods, in the Tassie bush fires, to mention just a few. But this happens after the disaster or the terror attack, not before them. Perhaps if people talked to each other before the disasters or tragedies, they could prevent some of them from occurring. Although there was security at the Boston Marathon, there was no way anyone could have prepared for a bomb filled with ball bearings laid at their feet – unless they were expecting it and knew where the bomb would be placed – along a 26.2 mile route. Boston has been largely open for business today, but parts of it are closed as part of the crime scene. More bags will be searched on public transport and heavily armed police will be out in force. Moments like these also remind us, as they did during 9/11, that the world has changed. And from this date forward in Boston, hardly a man (or woman) will be alive who won’t remember this famous day and year – April 15, 2013. Thanks, Tim. I’ll have a read. Cheers. Thanks again, Tim. I just read it, and agree it’s one of the best pieces written on the Boston bombs. Why? Why Boston? Previous sporting events have been targeted by terrorists. The Atlanta and Munich Olympics come to mind. The list of other attacks is endless. Some that come to mind, the World Trade centre 1993/1997/2001, USS Cole, Pan Am 103, the London underground, Oklahoma, Beslan, and closer to home, Hilton Hotel and Bali. Nearly every country in the world has suffered at the hands of terrorism. Most attacks have a common thread. Political or fundamentalism. And most had a complexity to the devices used in the attacks. So back to my original question. Why Boston? Can any one see the gain in attacking such an iconic sporting event. Surely not for the threads I have suggested. A pressure cooker, nails and ball bearings are hardly a complex device that conflict death and pain, not only to those involved but to a Nation and the World. Effective, but not complex. I ask why has no-one claimed responsibility for the attacks. I ask why the detonation of the devices was not planned for maximum carnage. Something is not quite jelling. You cannot prevent natural events, but you can fight like hell to try and prevent the evil that is Terrorism. As in all things earthly, prevention is better than cure. Yes, to rally and comfort after the event is a beautiful human trait, but perhaps looking for the reason, not at the result, might be beneficial. With respect, as usual, Slam. Slam, Sorry I didn’t see this until tonight. The evidence, such as there is, seems to point to a lone wolf, and Why Boston? Well, as we used to say in the sixties “because the whole world is watching.” Terrorists, whether in groups or individuals, love publicity. And I wrote “Perhaps if people talked to each other before the disasters or tragedies, they could prevent some of them from occurring.” As far as disasters are concerned, I was thinking of the Wivenhoe Dam situation and how the floods could have been mitigated if enough people got together to convince authorities not to release millions of tonnes of water in January 2011. Thanks, as always, for your thoughtful comments. Cheers, Tom PS I love your last line! Slam – it’s more likely the date than the city that was chosen. Patriots Day has a history with the home-grown whackos in the U.S. (the Waco raid, the Oklahoma Bombing). Thanks for your kind words. I’ll continue to follow my heart! Cheers.